: Cabinetry made for you and your unique needs and ideas, to meet your desire for a look that is all your own. : Cabinetry built to fit to your room precisely. Incorporating the look you want with the functionality and convenience you need. You have the freedom to choose and combine door styles, finishes including stains, paints, glazes and washes, even custom matching of colors. The finishes allow you to achieve a look from old world to high gloss paint. Our finishes are done by hand with attention to detail. More than traditional built in cabinetry you can create beautiful free standing furniture for any space in your home. 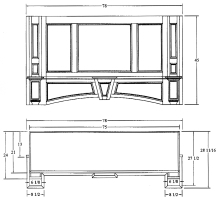 Our company will even be able to mimic most historical furniture styles. You have the choices of framed or frameless cabinetry, with full overlay or inset doors. The doors can be built from 3/4 “ thick to 1 1/4 “ thick. Our options allow you create a very traditional, country or a sleek contemporary look. Virtually any style is available to you. Doors Styles are available in raised panel, recessed panel, slab and mullioned doors prepped for glass.